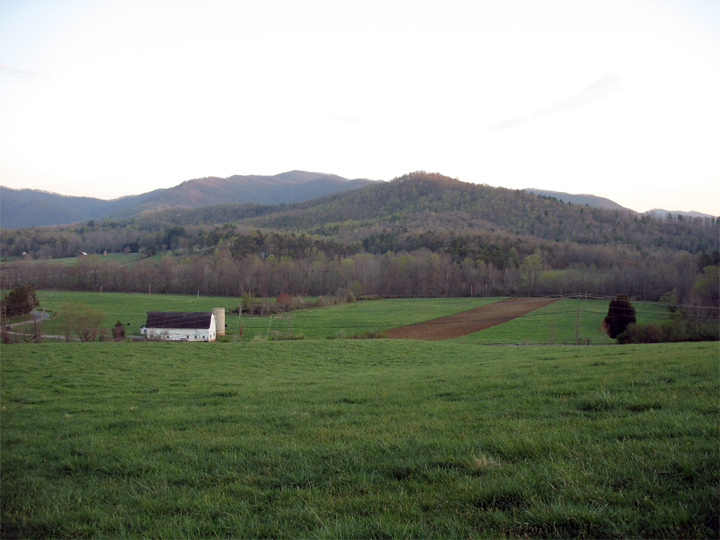 The Warren Wilson College Farm (WWC Farm) has been in continuous operation for 117 years, when the college opened as the Asheville Farm School in 1894. Some of the land would have been farmed in the decades prior to our ownership, by other settlers. Thousands of years before this, we have evidence of cultivation by the pre-Cherokee tribes of the Swannanoa River Valley. The land is rich, with good soils in the river bottom supporting a long term crop rotation of corn, small grains and forages. The upland pastures vary in their productivity, but in general, they are highly suitable to the production of forages. In the early days of the farm, production was for college consumption and surplus sold or traded. Meat, milk, timber, wool, and vegetables are a few of the crops they produced. For most of the last four decades of the twentieth century, the WWC Farm focused on beef cattle, farrow to finish hogs, corn silage and some grain production. The cowherd numbered around 100 at times, with large framed cattle eating a diet of corn silage, planted on most of the 125 tillable acres, and calves sold as feeders or pre-conditioned cattle. Some cattle were finished for college consumption and butchered in the basement of a dormitory but this practice was discontinued in the 1980’s. The hogs were managed in dry lots with farrowing and finishing happening in confinement houses with crates.  This century brought “new” management approaches, such as returning to a crop rotation and more intensive rotational grazing for the cowherd and swineherd. These practices resembled ones that would have been used in earlier days on the farm. Although poultry have long had some minor role in the farm operation (Katherine Laursen, a former farm manager’s wife, prepared a batch of meat birds raised at WWC for a visit by FDR in 1945, we have expanded layer and broiler enterprises significantly over the past few years. Today the farm has evolved into a fairly tight system, although new enterprises always bring challenges. Of our 350 acres, 100 acres of our ground is cropped, 175 acres are in pasture or hay land, and the remaining 75 acres are riparian areas and other land managed solely for wildlife. Two full time managers oversee 28 student workers on the farm, including four student managers of the farm’s animal or marketing enterprises. The crop rotation is a critical part of sound stewardship of our bottomland. Two of every four to five years, the land is planted to a legume based forage mix, usually alfalfa and some improved cool-season grass. Each spring, the corn ground is moldboard plowed and after harvest in the fall, a small grain like barley is planted. After barley harvest the following summer, annual forages are planted until fall, when the field is seeded back to forage. Research has shown our organic matter levels have risen with this approach, despite our reliance on traditional tillage. Much attention is given to timing tillage, avoiding unnecessary tillage, and using sub-oiling, grazing, and the crop rotation itself to ameliorate the effects of tillage. soybeans organically as we try to reduce our only purchased feed grain: soybean meal. Corn is planted around May 1 after a fine seedbed has been prepared and compost has been applied and incorporated. We are currently planting a Blue River Hybrids 104 DTM corn on 30” rows at around 28,000 seeds/acre. Crows are our most destructive pests and I estimate that they reduce our populations by as much as 25% despite our efforts to control. Corn is rotary hoed for weed control after emergence, usually 7 days. First cultivation comes after several weeks and we try for 2-3 cultivations with the latter one using less shovel but more aggressively throwing soil at the plants. Weed control is OK if a good stand of corn germinates, but weak stands with little canopy have many weeds in the row. We historically planted longer season corn and harvest occurred mostly in late October and November. This past year we harvested corn in September, the earliest in recent history. This allowed us to graze corn residue with dry cows, giving us one month of emergency feed for 70 cows on 25 acres in a drought. The subsequent tillage and barley stand was the best I can remember in my 10 years. Our cowherd is rotationally grazed and calving occurs in late winter and spring. Our Angus based herd also includes a variety of continental backgrounds in our cows, and Rotokawa Devon from New Zealand has been added in the past 6 years with A.I. The herd is predominately black, as we have intensively selected Angus sires with balanced traits that match our needs to produce premium grass-fed beef within 18 months. OCC Emblazon 854E (Black Angus) is a recent addition via A.I. to try add economy to our heifers. We have used many high performance industry bulls, such as “Conneally Lead on” and “Boyd On Target”. With good forages on good soils, the offspring fit well with the weak link being open first calf heifers. Grass-fed beef is one of our featured farm products and we were the first in the region to offer it. Beef quality has improved considerably in the past years with much attention paid to both genetics and management. Moderately sized, easy fleshing cattle with good temperaments make for good beef as long as management is in place. 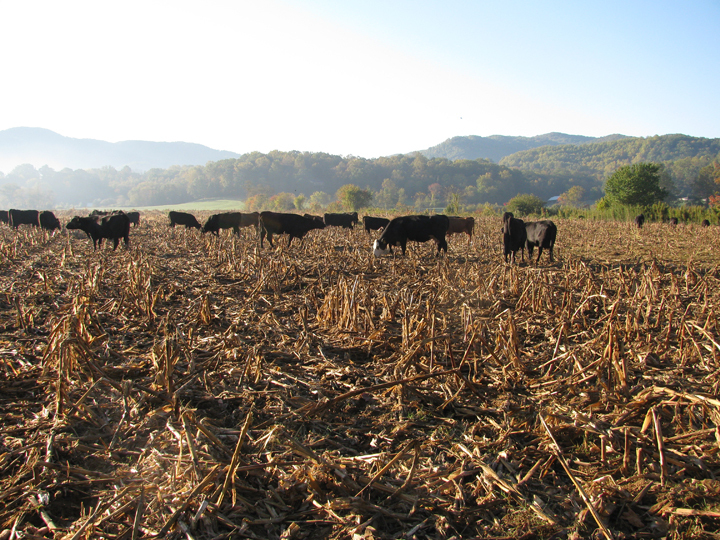 Keeping cattle steadily gaining weight by giving access to choice forages is important. We weigh weaned cattle every thirty days until slaughter to insure proper gains, particularly in the winter when rough hair-coats can hide problems. Beef is marketed through our mailing list at several annual pickups, and also through our college cafeteria. Beef is sold in quarters, weighing 100 lbs., and also a 33 lb. pack. We have had some good success with forages over the years, and trial and error has made us better at getting good stands of forages established in the crop rotation. Mountain pastures, with fescue, clover, bluegrass, foxtail millet and others, support our lactating cowherd in the growing season. Pastures with heavy fescue components are used for winter grazing of stockpiled fescue. Leys, or the portion of the crop fields planted to improved forages are used for finishing beeves and others are planted to alfalfa/orchard-grass mixes. Mutua prairie-grass, alfalfa, clovers and Puna Chicory are the backbone of our “finishing mixes” but recently we have experimented with adding perennial rye-grass as various stages of establishment. New varieties of alfalfa, that offers increased resistance to Potato Leaf Hopper or tolerance to traffic and poorly drained soils contribute to our overall success. New BMR varieties of annual forages, both Sudan/Sorghum hybrids and Sudan hybrids fill the gap after barley harvest to forage seed down in Sept. These are very palatable, high in TDN and grow well in the heat. We regularly test forages for quality and have just added a rising plate meter and refractometer to our toolkit to monitor forages. The farm keeps about 20 crossbred sows for our farrow-finish operation. We average about 8 pigs weaned per litter in both English style farrowing huts and modified indoor facilities. Of the three hundred pigs born each year, only a third are kept for finishing on farm. The rest are sold to other local farms. We currently finish hogs on a mix or forages and farm grown grains. Sows are the primary focus in rotational grazing and we have made good progress developing a system that works. Mirafount frost free waterers are installed in convenient locations in our tillable hog field, and cereals, warm season annuals, brassicas and other crops such as corn are planted to fill feed needs at different times of the year. During the winter, sows are kept in our old confinement house on deep bedding to prevent destruction to our fields. Growing pigs are given a sacrifice field, and all other hog fields are now kept with a green winter cover. We use a mix of natural service and A.I., and there are three boars on farm right now. We use one local seed-stock producer who is certified disease-free and we have contracted him to produce Berkshire/Duroc hybrids and also Chester White/Duroc crosses for gilts. Sows are kept until they no longer produce and are culled for sausage patties for the cafeteria. 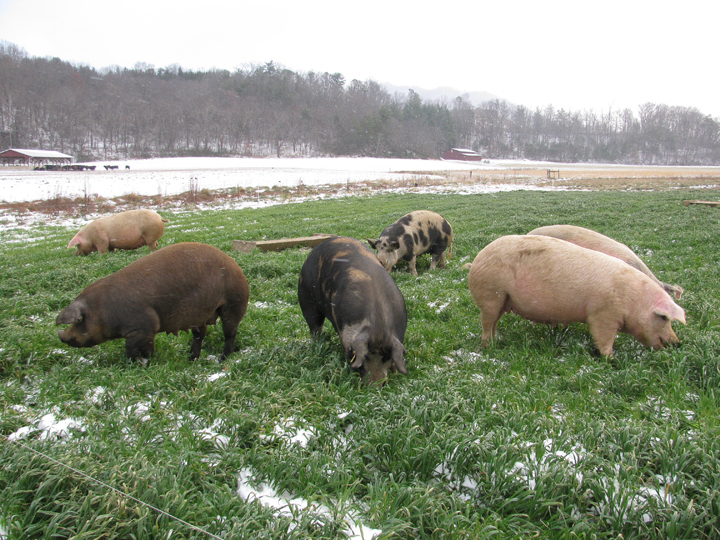 We are one of the only farrow-finish hog operations in the mountains and our pigs are easy to sell in the spring. Our laying flock numbers about 350 with a mix of heavy, brown egg laying hens. 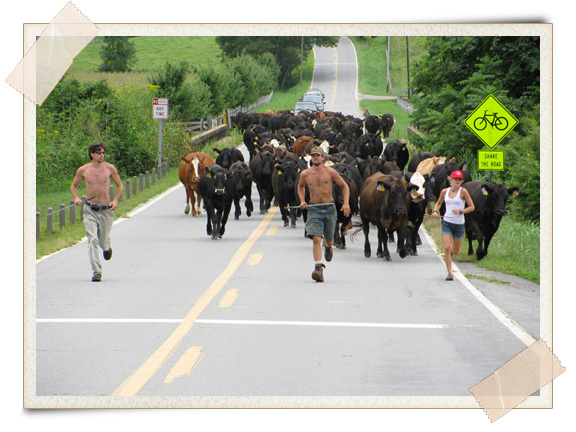 They are moved around with the finishing beeves on high quality forages, and allowed to roam large areas. The heat of summer keeps them close to the house and even in cool weather, the birds rarely reach the edge of the large pasture. Predation has been low to date, but we continue to lose a few birds here and there through the winter for unknown causes. Eggs are sold in our farm shop but surplus were marketed to the local natural foods store this past season and also at the college market. We raised about 600 meat birds last year, and 50 turkeys. The meat birds were a mix of Cornish x Rock hybrids and Freedom Rangers. We are raising Freedom Rangers exclusively this year. We have been renting a mobile processing trailer to butcher birds and will continue this and also send some to a new processing facility in the next county. Birds are brooded in our farrowing house and finished on pasture in an A-frame and a re-bar “yurt” with bell waterers. We try for about a 5.5 lb. dressed bird. The most important part of our farm is the education of students. Lots of time is invested in training students to operate equipment or to perform a variety of farm tasks. They essentially run the farm, with guidance from two managers. The work is very engaging and students are encouraged to be independent, to give them a real learning experience on a working farm. Some go on to work in agriculture; others work in veterinary medicine, human medicine, law, and international agricultural development. Students continue to be at the center of the Warren Wilson College Farm’s success.